VOX whining about ignoring Climate Change – at the Democrat Debate! | Watts Up With That? VOX whining about ignoring Climate Change – at the Democrat Debate! 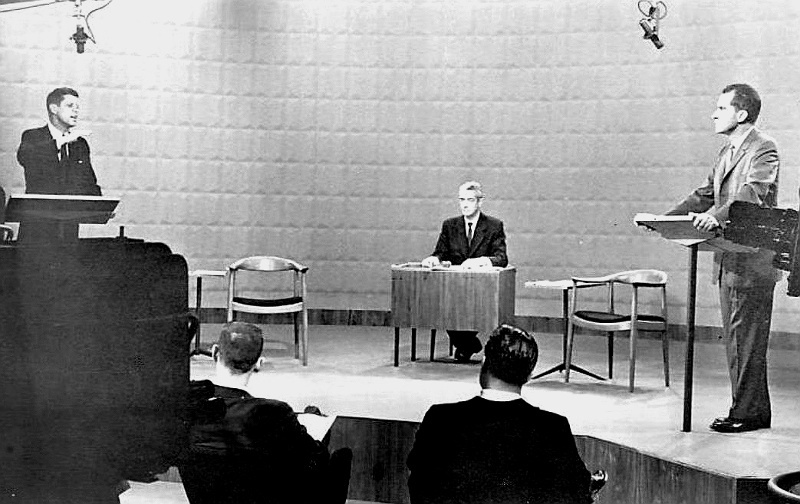 First Presidential Debate 1960, public domain image, source Wikimedia. VOX has published a gem of an article, complaining that even CNN, the sympathetic TV station which covered the recent Democrat Presidential Candidate Debate, thinks Climate Alarmism is a special interest movement for fringe hippies. In 2012, CNN’s Candy Crowley moderated the second presidential debate between Barack Obama and Mitt Romney. Afterward, she explained why climate change never came up. This moment became something of a legend among, uh, “climate change people,” as it showed so clearly the way CNN understands the issue: as a boutique concern of one faction of the left, namely environmentalists. It’s not a “main thing” like the economy, and certainly not part of the discussion of the economy. Public awareness of climate change has come a long way since then, and so has the Democratic Party. CNN, it seems, has not. The problem with this nonsensical assertion, that climate change is of overwhelming interest to the public, is that it is simply untrue. Hardly anyone thinks climate change is a priority anymore. Even the climate obsessed bureaucrats at the UN can’t produce a survey which suggests people think climate change is an important issue. Politicians and pundits who think persist in flogging the dead climate horse, who think worrying about future anthropogenic climate change is a motivating factor in most people’s lives, are simply ignoring the facts. 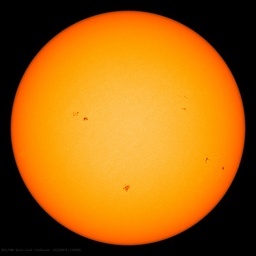 Decades of failed apocalyptic predictions, and of course the Climategate Scandal, have taken the heat out of the issue. October 14, 2015 in Alarmism, Politics. ← New methane scare off Washington coast begs the question: did anybody look for these before? I’m not sure that Jim Webb mentioned it in his opening remarks, but later he declined to jump on the wagon, pointing out that China and other countries will have more to do with CO2 emissions and therefore a national approach won’t cut it. Well I certainly care about climate change. The next major change will pile a mile of glacial ice over my house. I love that! You may have to become a climate refugee, and head for the equator! Winter is coming and I applied for refugee status to Hawaii, but so far it has been rejected. As a Canadian you’ve just given me an idea for winter. Many come to Yuma, AZ, to be close to Mexican doctors and dentists. They can get procedures done without destroying their budgets and they can’t get them done in days instead of months. The little town of Algodones is mostly dentist and doctor offices, with tax-free booze available next door. Pharmaceutical prices are great, also. No, I don’t go to Algodones, myself. I have medicare and supplemental insurance. I noticed in the debates that a few times when climate change came up, there were only a few half-hearted claps, nothing like the thunderous ovations that came up for economic inequality. One hopes that the advisors for the candidates are taking note of what works and what doesn’t. Funny, I understand man-made climate change very well, and I also don’t take it seriously. So if those who don’t understand it are not taking it seriously and those that do understand it are not taking it seriously, who is taking it seriously? Oh, that’s right…the ones who get paid to take it seriously. The ones who are getting ripped off by governments and regulators and are seeing their private property being pulled from beneath them are beginning to take climate change and “sustainability” very seriously indeed! I say watch very carefully who you elect into office! Looks like they got what they needed. 1. No enforceable world wide carbon tax, but they did establish a multi billion dollar fund. 2. CO2 remains a codified pollutant in the US. 3. Social justice agendas are teaming up with cagwistas on local levels. Human rights cases seeking disparate impact are a comin. 4. Uptrend in permission to stand aside and let the fringe play (that pew poll I sent). There’s more behind the scenes in terms of who gets what … brics, transport rights (rr’s/shipping), 3rd world resource development but I wanted to keep the bullets simple. So let’s play it out 10 years. They lock down 1T (wag) over 10 years and get to pursue local class action lawsuits using CO2 burdens. Let’s say it gets colder and da peoples start saying ‘hey, u robbin us’. Cagwistas and social justice warriors are gonna say ‘but the scientists were wrong, not us, we were duped too’. One of the better ways to get ahead of the coming damage is to repeal the CO2 pollutant status. I did note that Bernie was called out as a former supporter of the Sandinistas. Bernie is the kind of guy flawed candidates want because he’s still considered a fringe dude in the US. He’s associated with socialism which is raw meat for a good chunk of the populace. He’s the mark. The scapegoat. Clinton has loads of credibility trouble so having Bernie is kind of a blessing. He’s a distraction (scapegoat) from her. I highly recommend a book called Machevellian Intelligence by Dario Maestripieri. 200 pages easy read, no pictures for the busy folk. Rhesus monkey researcher who did a marvelous job showing how the rhesus does many of things humans do in the social sphere. The rhesus is also a big fan of scapegoating. It’s a good book because we as humans are going to be biased in evaluating ourselves anyway. The rhesus approach, while not perfect, allows us to see how the behavoir plays out. Decades of failed apocalyptic predictions, and of course the Climategate Scandal, have taken the heat out of the issue. I have the sense that Climategate changed the political climate more than we all appreciate. Its effects include contributing to the failure of the Copenhagen COP, though the Saudis, Chinese, and Indians had a bigger impact. It also changed the readership of WUWT in ways that are still visible today. Thank you for mentioning it here. The weather impacts for that COP contributed in their own way, both at Copenhagen and convincing President Obama to leave a day early to get home before the blizzard moving into Washington got too bad. The image of Air Force I landing at Andrews AFB in the snow was one of my favorites. Re: French Govt. TV channel 2 weather guy Philip Verdier getting sacked (Letter , No Not Come Back to Word). He released a book he wrote that goes after the data base of the Climate Change cult’s fraud. He says he could no longer do his job due to the problem’s he sees in the data. Not a little deal some would think. Yes, that just about sums up most criticism of skeptical positions. Do people understand that almost nobody denies the slight warming trend, shown by RSS, UAH and Balloons? Do people grasp, that the “models” predicted an increased RATE of warming with increasing CO2 emissions. Are they aware that the rate of warming has decreased since 1997/98 whilst CO2 emissions have increased. Hence the models are not just a little wrong – they are completely wrong – so far. And so the only way to maintain ignorance is to not read anything published by genuine skeptics. Not reading skeptical material is now the preferred choice of policy makers. Reading skeptical material could quite easily ruin a person’s career. Who the hell would want to ruin their own career by investigating actual facts. I haven’t read Verdier’s book – YET – but I and many others will. At least I will read it if an English translation is produced. Hurrah for Verdier – I hope that he has got his facts right. We have to be beyond reproach. Whilst they seem to be able to be consistently wrong, and still get the alarmist headlines. Thanks for the link, a great story. Even though the MSM is rubbishing his views at least they ARE getting aired and may, ujst may, make some people start to think. Especially as he is such a well known figure in France..
Over on the right hand side about 8 things down. French Govt. TV channel 2 has let go Philip Verdier their weather guy on there weather reports in France. Seems he wrote a book critical of the base data on this Climate Change fraud and said so on the air. He then got a letter, (Do Not Come Back to Work) sacked. Story written by Henry Samuel dated Oct. 14th at 5:45. Not unimportant some would think. In Australia, you have to agree to CAGW to advance in your career, according to one of the Bureau of Meteorology staff. It is notable that disparities between raw data and massaged data at BoM were to be investigated but the new Prime Minister blocked it. He is on the record as saying he refused to listen to anything sceptical of CAGW. In a previous career he worked for Goldman Sachs. Thanks for the GS — Minister connection. That’s pretty sad. Every scientist should have a backup trade these days. >>Hardly anyone thinks climate change is a priority anymore. Especially after several harsh US winters. You have to understand that it is very difficult for Jo Public to put Global Warming at the top oh his or her priority list, while they are trying to dig their car out of the snow…. “Especially after several harsh US winters.”…. Tell me of another kind ?? The US might get a slight reprieve this year. In the winter of 2014/2015, there was recorded a “greatest ever” icing over of the Great Lakes. Of course, the “greatest ever” was during the only recent years of satellite coverage. Apparently the headline writers forgot to consider that the Great Lakes were created by mile plus high glaciations. Sorry, multiple mile plus high glaciations. CAGW will be back at this year. Thanks to El Nino, they will complain about the record rainfall, the record heat and how abnormal the weather is, I predict. Why do I feel a sense of relief, a warmer winter over the last few and rainfall in california where most of the food is grown. ? The east coast will get buried worse than ever in snow this winter. This will be reported as “climate change” caused by humans. Even with a mile of ice over their heads, the climate profiteers would still be claiming that CO2 was the cause. Crowley didn’t bring it up because it would have cost Obama the election to say anything about it. The Democrats wanted that issue to slide under the election radar. Why Romney and the Republicans didn’t bring up a “dead” issue is another matter. Were they that asleep at the switch? Or were they fine with the under the radar strategy, too? You simply can’t keep telling people each whatever month is the warmest in the record, while their senses are telling them that it’s freaking cold outside, spring is coming later and fall is coming earlier. When people start to realize that they don’t have to drive north for two hour to ride the snowmobiles like they did 5 years ago, the just stop buying into the religion of Apocalyptic Global Warming. Good point, it’s cyclical or just depends when you bought the sled. Lesson learned during the dry 90’s into the 2000’s in the Midwest. I’m sure there are bar/resort owners in northern Wisconsin/Michigan that can give you detailed records of snowfall/trail conditions and traffic thru their particular establishment. It’s Vox….Ezra Klein’s gaffe a minute interweb machine. National Lampoon, if still alive, would be a better source…for anything. Crying wolf is a short term gain strategy. Doom due to specific causes, which morph over time, tend to get old fast. 1 CAGW is a phoney alarm which has harmed society world wide..
2 Society will seek retribution. 3 More CO2 is beneficial to most earth plants. Course deciding who the witch is has always been the ethical difficulty. 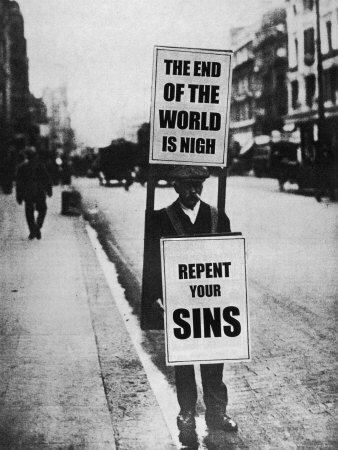 Like the old sandwich-board men, bearing messages that ‘The End is Nigh’. It can only scare you for a week or two, even if you have very little knowledge or sense. A climate ‘scientist’ surveys the data, crunches the numbers, and comes to a ‘rational’ conclusion…. For awhile, caGW was at the forefront of the excuses for the need to control this or that for what are really political reasons. It played well with the public then. No fingers were pointed at an identifiable group of people (other than the ever nebulously defined but always villified “rich”). The public is beginning to notice what they see outside their windows isn’t what “the excuse” said it would be. Those who promoted “the excuse” will consolidate and solidify the controls they have put in place. Until a new excuse is invented for even more control, they will keep playing the same tune. AGW has been overplayed and everyone knows it and is tired of it. For the POTUS to continually harp on AGW as “the biggest threat to mankind today” while wars are raging with religious terrorism spreading causing mass migration and the world economy teetering is only making intelligent people mad. I also see the world tiring of the bullying by the US to succumb to AGW fears. Politics in the US is over AGW…..except for the Administration that is still acting like a paid shill. Easier for Obama to fight global warming than Russian and Chinese expansion and military prowess. Our President needs easy problems. He has repeatedly proven he can’t handle any other kind. He said fighting ISIS is trivial – it takes REAL leadership to blag on about climate change. OK, how’s that real leadership going? U.S. has no cap and trade (except a state scheme in the People’s Republic of California, and that’s only so like Greece they can collect credits as factories close down and move to Texas). They have no carbon tax / price. No emission targets. They have increased production of gas, and have minimal wind energy by Euroweenie standards. They refuse to pay carbon reparations to the 3rd world. And they are one of the few countries never to sign Kyoto. Oh, and he signed a deal with China that positively encourages them to boost emissions by 150%. While allowing deforestation to feed Vermont wood into Drax. Judged on his own standards, his leadership has been as bad on AGW as it has on, well, everything. Your underestimate what has been setup. CO2 is now a pollutant. Mr Homewood just showed you a data visualization NGO. They and others already have the database to start identifying who gets a check due to disparate impact. NGOS are aware of this and plotting. The Supreme Court of the US just validated disparate impact. Maintain the political power base by giving people stuff. Not new, just done better. Not so in your face. You wouldn’t tolerate that. Poor “Climate Change”. It’s become the Rodney Dangerfield of political issues. It don’t get no respect. Did any one care to define what they ment by “climate change”? “climate change” means someone is doing something wrong that needs to be changed. in this case, burning fossil fuels. mostly coal, which is bad, because it is cheaper than oil. which hurts the oil business. so “climate change” means “stop burning coal”. I’m still waiting for the definition of “carbon pollution”. Considering that many of the [folks] who lie to use it so often are also believers in the concept of a [planetary] carrying capacity, I have to wonder if they believe the term extends carbon based life forms of the two legged [variety]. Also, there was a petition for CNN to have a “liberal’ moderator instead of Anderson Cooper and Don Lemon! I LOLed at that. It is so depressing to learn that the science that I once believed in as a child has become the ” Monster under the Bed” !!! I think one area of political blowback is the recent RICO scheme. That showed a lot of politicians that a huge amount of money they control is going to alarmism but not showing up in campaign donations. It’s not supposed to work that way and they’re pretty hacked off about it. Some sacrificial alarmist lamb will feel the burn and the rest will quickly get on board. That’s a particular pet subject of mine. Sorry I’m being a dolt but can you walk me thru your analysis just a little better. I don’t need cites just a little better walkthru. Huffenpuff is upset that he didn’t get his slice so he seeks retribution ? The word climate was mentioned 22 times during the debate. All yammered about it. And offered virtually nothing concrete, just platitudes. Someone should have asked them if they were going to leave Vegas on bicycles, or fossil fueled private jets. A pretty good explanation is right there in the link name “Obama-too-wrong-side-on-climate-change-says-physicist-freeman-dyson”. Dead Horse flogged to death by dead dogma. Down in New Zealand, most media types, and many politicians, inject climate change into just about anything, especially anything to do with coastal real estate. Its gotten so bad we have to step over piles of dead, flogged horses in the street, in our capital, they’re piled up neck high. Rodents should be having a field day on the corpse mountain, but even they won’t touch that carrion. We have an emissions trading scheme (enforced by a Cuckservative Right wed to a Multi-Culti-Marxist wife), adding an overhead of misery to all Human activity, so businesses suffer, and they pass the suffering on to us. The cost of living has spiraled upwards like Dorothy’s house in the Wizard of Oz, the former Wizard of OZ, Tony Abbot, got rolled by a Klymate Tru-Fan, and they’ll be adding horse meat to their political menu soon too. But with the Paris climate cult-fest 2015 coming up, and knowing the French predilection for devouring Equine cuisine, we should see well stuffed reps waddling to back Charles De Gaulle après le banquet sans regret. I admit to being a climate activist, I just put another log on the fire closed the door. In the past where I live, those of us who lived out in the country could burn our burnables in a burn barrel; however that has long since been verboten. But I do have inside my house a pot-bellied stove which burns my burnables, keeps me warm, and produces more CO2 for my garden. I think I’m quite green – don’t you? When we bought our current house there were 2 barrels in the back. They had been used as “burn barrels” but were not fixed as such or used as such. They were both filled to the top with stuff – some of that was ash. Most of it was junk – bottles, food & beverage cans, busted light fixtures and old wire, bolts/screws/metal pieces – and more. The weight was such that I could not pick them up, so had to push them over and rake through the mess and repackage (in boxes) most of it for the landfill. At his new location, the previous owner, using another outlawed barrel, nearly set the county on fire. The fire-fighters were not amused. Common sense is not common. This past month the state’s Department of Ecology paid about 80 county residents $250 each for old wood stoves. Ours was a 1980s model. Our new one was installed yesterday. The installer would have charged $100 to cart that old one away. Yeah, it must be hard to get funding for Zombie Research. Climate Change is too big to fail. I searched the debate transcript for “Climate Change” and found it was mentioned 23 times. The word ‘tax’ in all its forms was also mentioned 23 times. We all know how much Democrats love taxes and taxing the rich. So why is VOX complaining? Did they want the entire debate to be about nothing but climate change? Apparently, the “specific plans” Hillary has already put forward have yet to be laid out. I guess she wants to take credit now for what she plans to do in the future. I also found it interesting that it is currently not possible to invest in science and research. A Hillary presidency, however, is going to make such investments possible once again. She is also planning to use the “broken window fallacy” to grow our economy by shutting down perfectly good power plants and replacing them with unreliable ‘clean’ energy from solar panels and wind turbines. And yes, she plans to use government subsidies to make it possible. It sure sounds to me like our economy is going to suffer if she becomes President, but big energy donors and cronies are going to make out like bandits. Pay attention to Ms Clinton’s choice in running mate. Ms Burwell is the Health and Human Services (HHS). Powerful arm of the government that is likely to be the administrator of making sure CO2 impacts are properly distributed (disparate impact). If she is selected as the VP, it will be because she is the transition piece between this administration and the next concerning CAGW. Meant to say HHS Secretary. Notice how she and others like her uses the incorrect phrase “good-paying jobs”; it’s a clumsy and transparent attempt to be buddies with the bubbas. Notice how she and others like her uses the incorrect phrase “good-paying jobs”; it’s a clumsy and transparent attempt to buddy-up with the bubbas. Apparently, the “specific plans” Hillary has already put forward have yet to be laid out. I guess she wants to take credit now for what she plans to do in the future. Why not, Obama got a Nobel as credit for future actions. Nixon could claim that he lost the debate because climate change made him sweat profusely on TV. It didn’t help his 4 o’clock shadow either. It isn’t what candidates say before elections it’s what they will do after they are elected. Watch who the parties are that are backing a candidate. Obama got elected on change but people didn’t know what he meant by change. These changes haven’t hurt people much yet but they will. They may not grasp the principles of evolution. But they have created an ecosystem in which only the gullible and submissive can survive. Pell has made the mistake of leaving his critical faculties switched on. I cannot see that there is a place for him in the RC church. Perhaps he needs to establish a breakaway Australian Church in which people are allowed to think. I was wondering how long Pell would keep his mouth zipped on this topic. No long it seems. Well done him. The RCC is not 1B people moving in unison. The Jesuits will be busy figuring out how to spin the cardinal for the Pope. It’s their job. It’s very unusual for a modern day Pope to come out so strongly on a “science” issue. On another note, he was an excellent PR choice. Do you have an opinion on who the cagwistas whip out next ? of course people forget, the current Pope came to power only as a result of the resignation of the previous Pope. the obvious question is this, what pressure was applied to Pope Benedict to make him resign? will the “climate change” Pope be the one that finally brings down the RC church? Pell is known to be a climate skeptic and I am certain he is concerned about damage to the church that can result from taking a stand based on Climate pseudo-science that will be proven wrong over time. I think he wants to avoid a breakaway caused by Francis’s non traditional leanings. this would explain the public apology the Pope made. It is very evident that the large environmental organizations have absolutely no belief in their own catastrophic climate scenarios. If they did they could have dropped their bs propaganda campaigns against nuclear and geothermal power 20 years ago and we could have cut emissions 40-50% and have lower electric prices to boot. But an actual solution is the last thing they would want. You can’t place a CO2 tax on nuclear energy. With no disrespect intended or implied to the fallen, because it is all a part of the same struggle for truth and freedom. When Climate Alarmists blow up school children, and splatter their body parts all over the classroom, they are only one step behind those who spread fear for the other protection racket. The intent is there, in the forefront of their minds, even if they have not followed it through as yet. Beware the fervent idealist…. The only debate most politicians have is which methods are best at sucking from the public trough. Isn’t VOX’ Ezra Klein – at WAPO at the time? – the one who was at the center of the media coordination scandal? Americans are not afraid of global warming / climate change. So, why debate it?